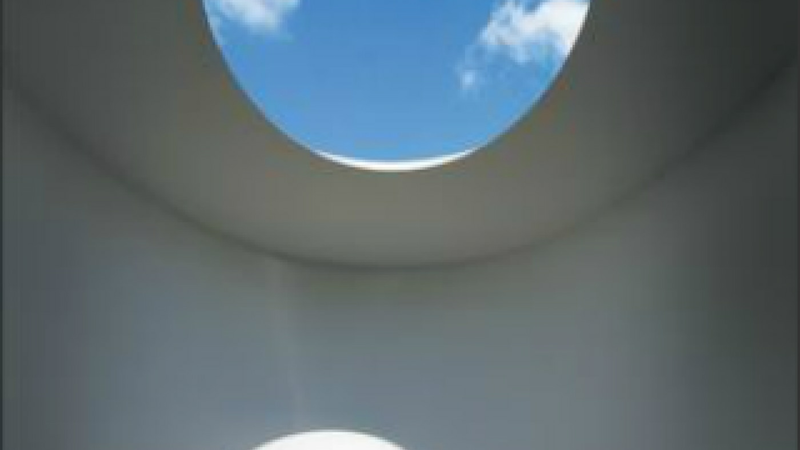 James Turrell is an artist whose palette is light, making the ephemeral monumental and encouraging his audience to look 'beyond', to see the extraordinary in the every day. Originally inspired by his day-job as a pilot flying planes close to the edge of the earth's atmosphere and through intense weather systems over Tibet and Laos, he now relentlessly explores the limitless 'into the blue' sensation of vertigo that flying vertically up brings. Part of this body of works are his 'sky-spaces'; simple buildings with an aperture incorporated within the structure that opens onto a small section of sky. The interiors of these spaces are gently lit to imperceptibly change colour, thus altering the perception of the small section of sky above ones head, (orange makes blue stronger, purple weakens the blueness) The simplicity of the building and materials used in construction, combined with the calm sensation of just sitting contemplating the sky give the Sky Spaces a church-like quality of worshiping light. I have been lucky enough to spend some time enjoying one of these spaces and I highly recommend the experience if you ever get the opportunity. Here at skinflint we are big fans of Art Deco and the stylish lighting which was produced in what was actually a relatively short era of design history. We recently supplied our lighting to East London Coffee Roasters Ozone, check out this short film explaining what they do and sneak a peek at our lovely lights in the background!